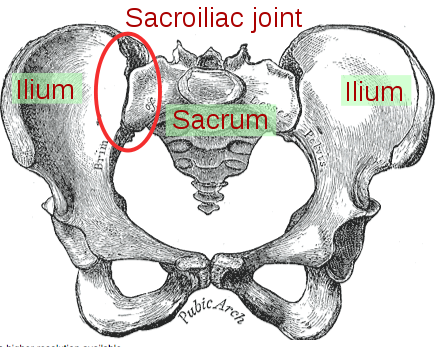 What are the sacroiliac joints (SI)? The sacrum is composed of five non-mobile vertebrae that are actually fused together, in contrast with the rest of the spine bones, which are mobile. The pelvis is made up of two large bones, medically known as the iliac bones. Where the triangular shaped bone (sacrum), in the lower portion of the spine, connects to the right and left iliac bones, the sacroiliac joints are formed and their main task is to connect the spine to the pelvis. 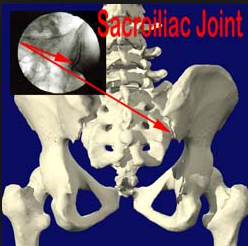 The sacroiliac joints are held together by many strong ligaments, thus there is little motion in the area. Actually, most of the motion in the pelvis area takes place around the lumbar spine or the hips. When we are erect, the sacroiliac joints are under a lot of pressure because they have to support the entire upper body weight, causing a gradual wear of the joint cartilages over the years, and eventually arthritis in some people. How can you identify a sacroiliac joint dysfunction? The problems associated with the sacroiliac joints vary in definition (SI joint dysfunction, joint strain, SI joint syndrome or inflammation) because sacroiliac joint pain can be caused by various factors. The most common cause for SI joint dysfunction is osteoarthritis (degenerative arthritis), which occurs in most weight bearing joints because the bones rub on each other after the cartilage layer (shock absorbing function) covering the bone, is damaged or worn out. Another common cause for SI dysfunction is pregnancy because of the increase in weight and pressure on the ligaments that combined with a change in the walking pattern, ultimately places a lot of stress on the SI joints. Actually, any condition that changes the usual walking pattern can and will increase the stress in the SI joints. The initial step in diagnosis is conducted by your Seattle pain physician and entails a physical examination and an evaluation of your medical condition, in order to identify the exact source for your pain, since this can come from your hips, lumbar spine or SI joints. When it comes to the physical examination, there are many ways to determine the source, the most usual one being a placement of your legs and hips in certain positions followed by applying pressure on certain areas that will move the joints. The next step in diagnosis is having X-rays performed. How do you treat sacroiliac joint dysfunction? 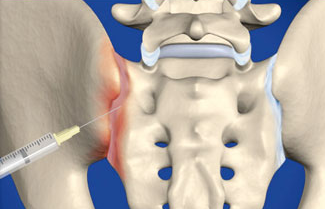 The injection procedure plays both the diagnosis role and has the ability to treat the pain. If the pain goes away, meaning the procedure was successful then you can expect the pain relief to last from one day to couple of months. Either way, you can repeat this procedure every few months. The top Seattle pain doctors at Seattle Pain Relief offer comprehensive treatment options for sacroiliac joint pain. Most insurance is accepted, and appointments are readily available.